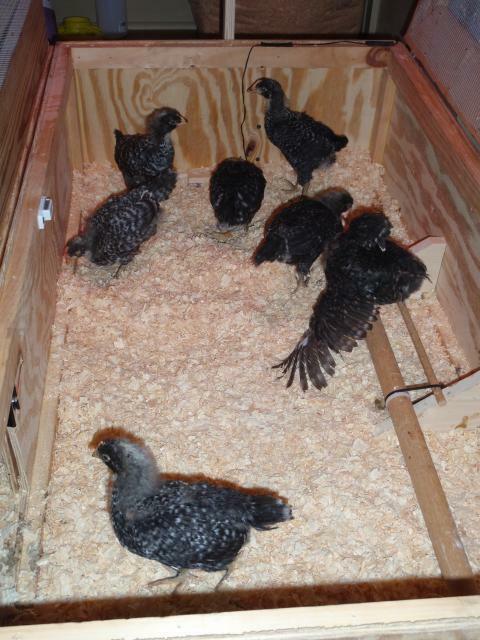 Tuesday June 7th, My Barred Plymouth Rock chicks arrived today. All safe and sound. 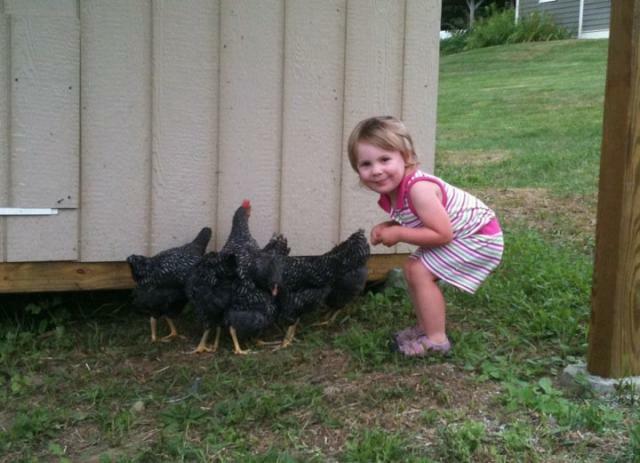 Hopefully they'll be 6 hens and 1 rooster some day. 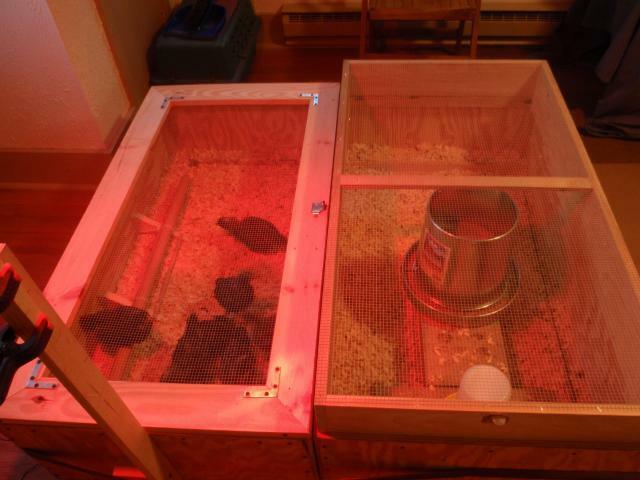 The little ones settled quickly into their new home, the homemade brooder converted from a wooden bike box. Tucker, our black and white cat has inspected the brood and approves. The chicks had their first night at their new home and all went well. They're eating, drinking and sleeping like it was their job! Wait, it is their job. They're pretty quiet so far. It's fun watching them all fall asleep at the same time and then suddenly they all decide to wake up and run to the food. And then fall back to sleep again. I've named three of the chicks so far. There's Pippin, she's the smallest and lightest colored chick. She was the first to drink, first to eat and first to try and perch. Even though she's the smallest, she's showing herself to be the smartest so far. There's Lulu, she has the most white markings around her eyes. And there's Dot. She has a small white dot under her right eye. I'm still trying to find distinguishing marks on the others to help me tell them apart. Once I figure those out, I'll name the rest. Was able to find names for two more of the girls. Patches, she has a white patch under her right eye and a dot under her left. And Connie, she has a dot behind each eye. The ladies and gent have already grown so much since Tuesday. They're really getting good at perching and they've begun to scratch to the bottom of the shavings. They're also trying to fly just a little. Very funny to watch them take a running start and then jump in the air. Today I cleaned the brooder. The girls handled being put in a temp box while I scooped out the shavings. It wasn't really that dirty, but why does it seem more dirty only after a few minutes of them being back in?! The weather turned cold and damp and I've had to move the lamp way down just to keep the temp at 90 degrees. What's this all about?! They're almost a week old and they've already got so many little feathers growing. 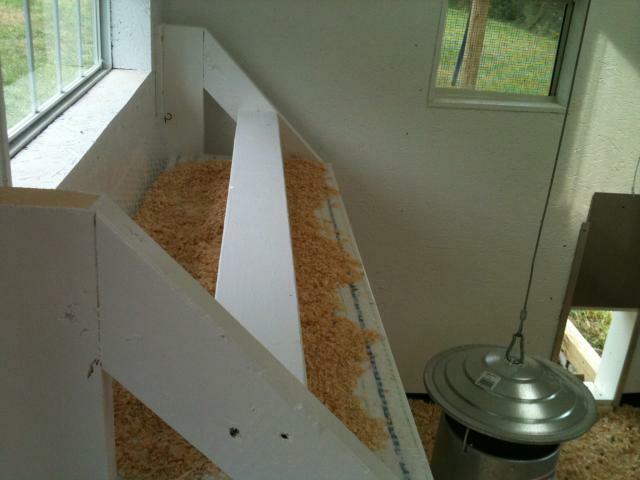 They've also discovered how fun it is to scratch at the bottom of the brooder and kick up all the shavings. And it' so cute to see them try and fly. Their little stunted wings flapping so hard. They also stretch a lot. They put a leg out to the side and back and stretch a wing at the same time. They're very coordinated. Today I left the girls alone for the first time. I had to return to work. I was worried about them all day long. 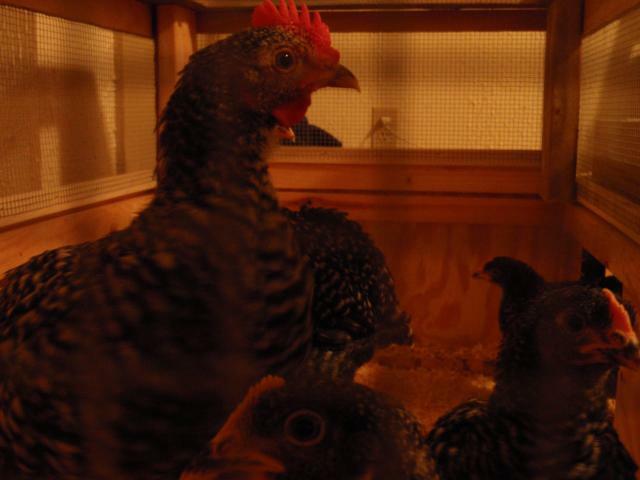 When I got home, their brooder was warmer than I would have liked, but they just moved closer to their food and water. I am amazed at how fast they're changing and growing. Lulu nearly jumped out of the brooder when I lifted the lid. They really perfecting their perching as well. I was concerned about their butts too. I'll have to keep a close eye on them, don't want any pasted vents! I'm at work and I can't stop thinking about their butts. I really hope they're okay. I'll have to remove the "paste" for sure tonight when I get home. Okay, got home and guess what?! All but one had a dangerous paste formed on their butts. So Eric and I, mostly I, worked to remove the paste with warm water and paper towel. When I got the paste off, I applied olive oil on their butts to help prevent more pasting. Let's see if it works! The girls had a nice day sans paste! They're growing big, strong and fast. I was just watching them all trying to perch at once. A couple of them are actually managing to sleep while perched. They're also getting very rambunctious, kicking and flapping their wings up a storm. They love to run collectively from one end of the brooder to the other. 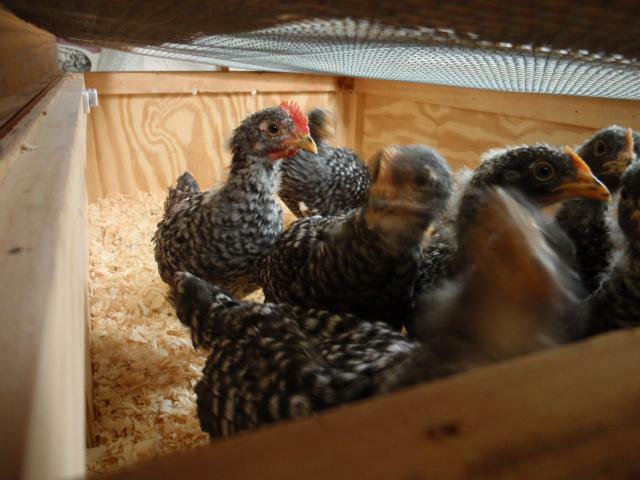 The chicks are really hitting their stride. Everybody is eating and sleeping and growing! All kinds of feather are popping out. 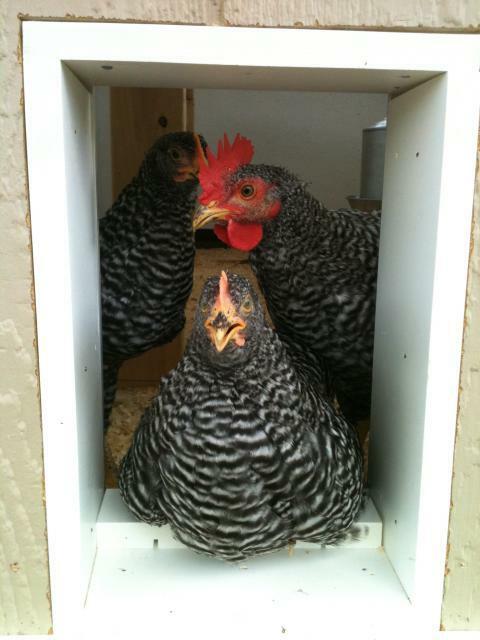 We really need to start on that coop or else I'll have to open up the brooder box and let them roam the house. Pretty much the same to report. Everyone is getting bigger and bolder. Some more supplies for the coop arrived today. I can't wait to get going on it. I'll have to talk to my drafting technician to complete the drawings (aka hubby) so that we can order the rest of the building materials. The chicks had their first field trip to the great outdoors! I put the play yard out with a tarp for shade and let the chicks roam around on the grass. They were very apprehensive at first, but they soon relaxed and picked at the lawn. 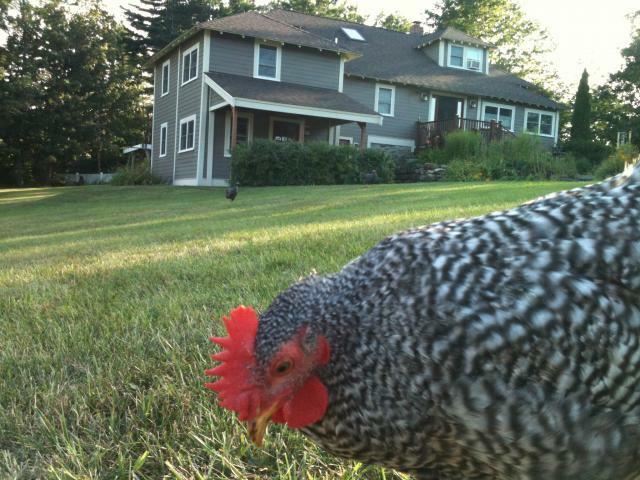 It was nice to see a glimpse of what it will be like to have chickens roaming the yard. Sunday June 19th. Father's Day. We took the family to Davis Farmland and Ryleigh really enjoyed all the different farm animals, including all the different types of chickens they had running around. It was cool to see what to expect when my chicks get mature. Oh no! Lulu appears to be plucking his own feathers out and he has two bald spots at his shoulders. I've done some reading up and I think the brooder might be getting over crowded. They're getting so big now. The need about 1 foot of space per chick and the bike box is not that big. We're going to take the other bike box and attach it to the brooder. This will double the space. Tuesday June 21st. Summer arrived. So, today was full of adventure. I worked from my home office today so that I could watch over Lulu and see how he was doing. I think the expansion of the brooder has helped. He's still picking, but I think it's getting better just the same. Also, I went to the local farmer's exchange and they made a suggestion...worms. So I got some crawlers from the Ashby Market and gave them two. Do remember the game, "Kill the Carrier" when you were a kid? Well...it would seem that worms are used for the same game in the chick world...It was so funny to see one chick pick up a worm and sprint away with it while all the others tried to catch and steal it. The other funny thing today, I walked in to check on the chicks and found a chick roosting on top of the water fount. 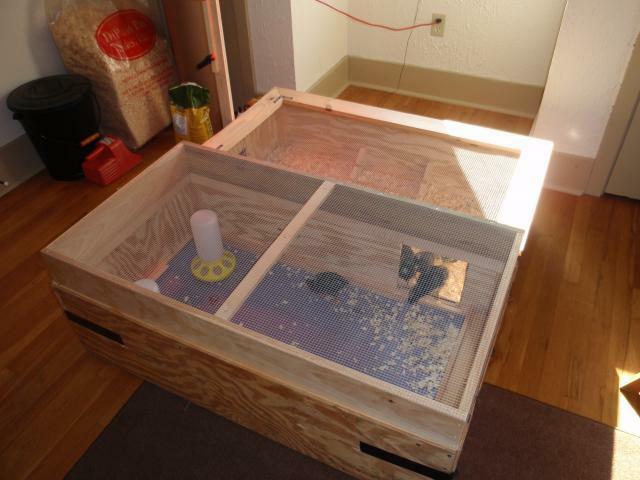 With the additional brooder space, they also got more head room. Enough to perch on their fount and feeder...So I've had to put some old plastic cups on top to extend the height of the them. It was really cute though. Lulu seems much improved. I was able to go back to work. When I came home he seemed even healthier. So glad we expanded the brooder. Lulu is looking way better. I've noticed that the chicks are starting to really chow down the starter feed. I'll be going to the store to pick up more tomorrow. The coop materials arrived this morning, yeah! It seemed like so much on paper, but sitting in the garage, it doesn't seem like we ordered enough! lol I did a full clean out of the brooder again and added some more bricks to elevate the water and feed. I wasn't putting shavings in the new addition, but it really needed it. Now there's fresh bedding all 'round. 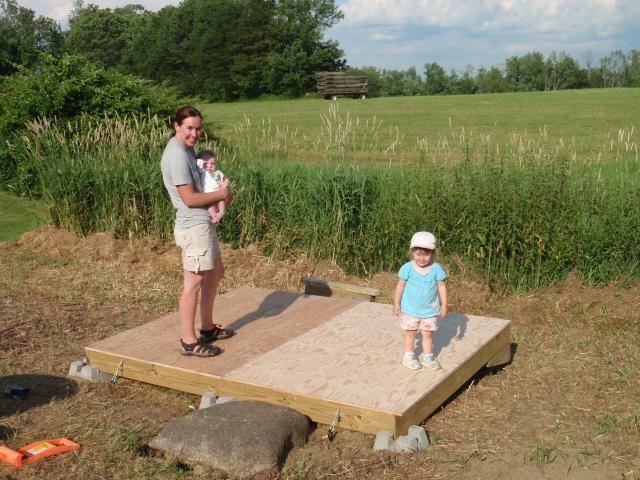 Nana and Papa helped look after the girls while Hubby and I work on the coop. 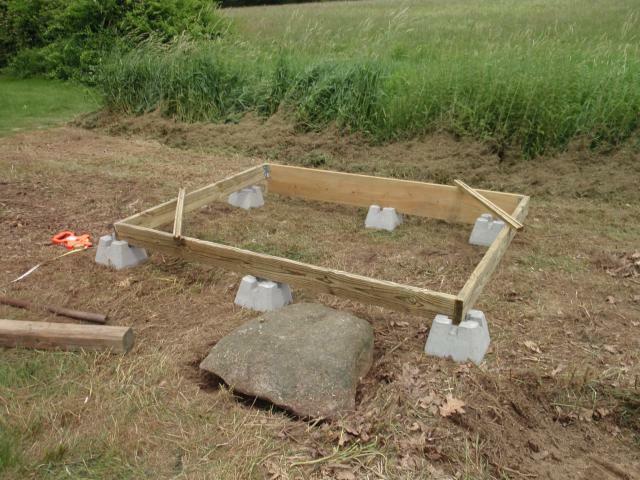 We were able to get the site prepped and placed the footings and built the floor joists. We would have liked to have gotten more completed, but such is life. I'm very excited. 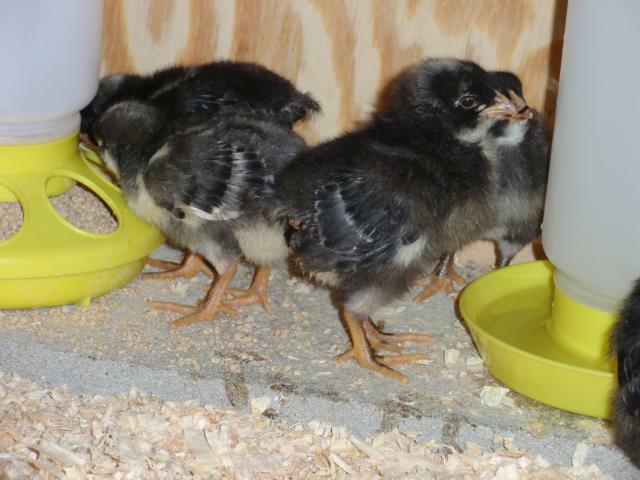 The chicks are three weeks old!!! Here's their latest pic. 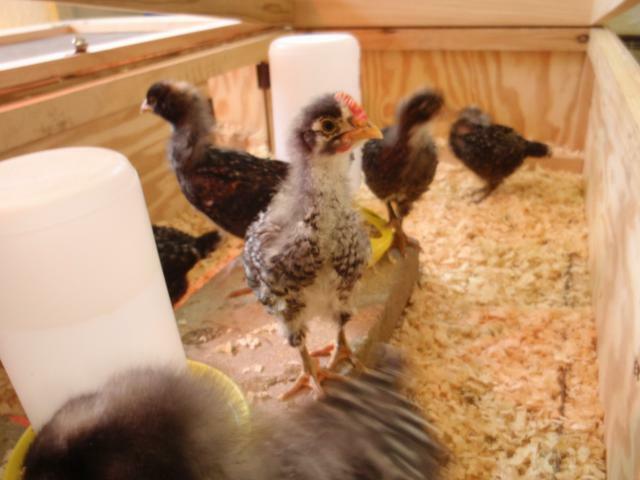 I sound like a broken record, but man, do these chicks grow fast! I feel like if I just sit and watch closely for a few minutes I'll actually see them change before my eyes. So, yesterday I tried giving them a hard boiled egg for the added protein since giving them earthworms can be harmful at this age (they carry grapeworm). Well, they really liked it. Tonight after work I came home and gave them another one. It was too funny. 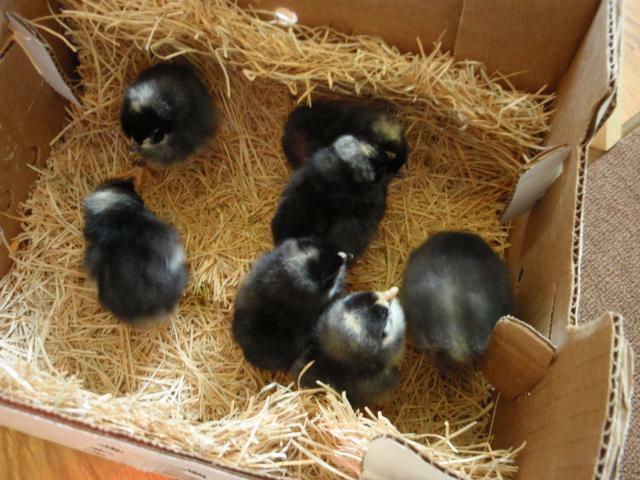 They were so excited that when I opened the brooder, three of them flew out. Two went right back in, but Lulu I had to chase around the room before I caught her. They devoured the egg this time. I wonder how often I should give them hard boiled eggs. I arrived home today to find that the chicks knocked over their chick feeder. Good thing the galvinized feeder arrived the day before. So, in went the new feeder with a lot more food. I suspect they knocked over the chick feeder in an attempt to get more out of it. I also upgraded the perch. The tiny dowels were just not cutting it any more. My husband found a nice big dowel in the garage and I just zipped-tied to the original perch. They immediately investigated it and ofcourse, Pippin, shown above, was the first to officially perch. Donna, like Blanch, has little white. Not sure if she's Blanch sometimes. I wonder as they get more mature if my method of identifying them will be obsolete. I HAD to clean out the brooder tonight. Boy was it stinky. And this time I sprinkled on the DE Earth. That stuff is so soft. And my fingers were so soft after touching it. Even after I washed them. Here's a couple of pics post cleaning. I gave the girls their regular evening treat of a hard boiled egg, but tonight they didn't seem too interested. Tomorrow I'll skip it. I let open the brooder again. They are getting very good at flapping their wings and sitting on the edge of the open box. And I believe I heard the very first "clucks" if I'm not mistaken. 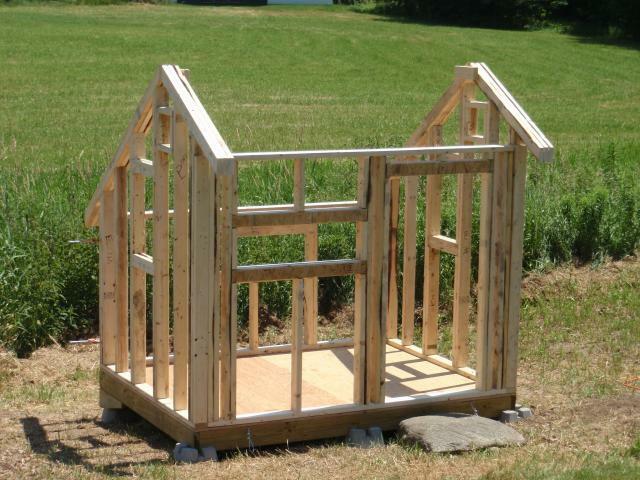 We better get that coop built this week. They are READY for it. A user on the backyardchickens forum said that I had more than one cockrel, but now I'm begining to doubt that. For awhile I suspected that Lulu was going to be a rooster, but Pippin is the only one to really showing his red crop and wattle. And he acts the most bossy. Sunday July 3rd and Monday July 4th! 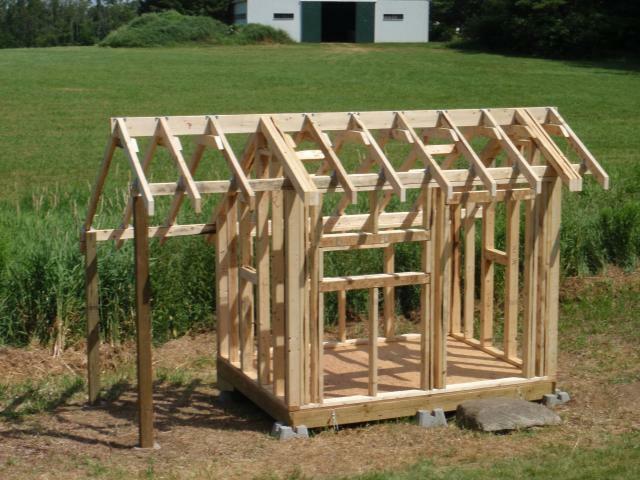 Big push this week to get the coop built. 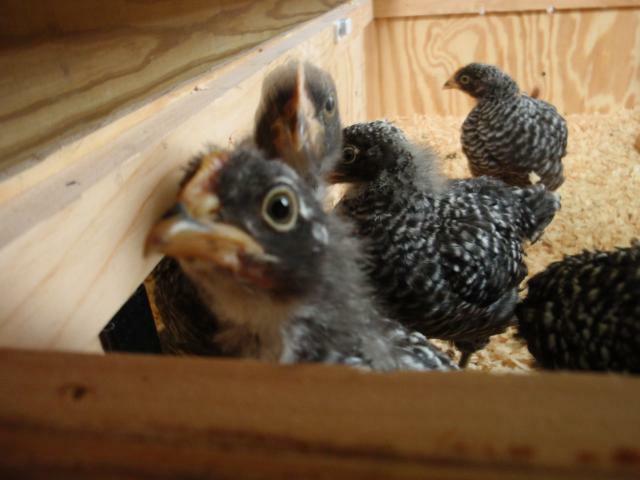 These chickens want OUT of the brooder. Today I found one of them had ripped a stip of paper from the brooder liner and was running around with it like she won a grand prize. They were all chasing her thinking it was something great. 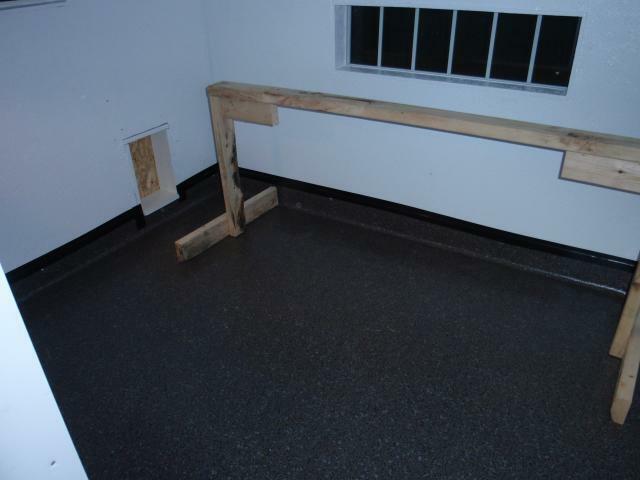 We completed the sub-floor of the coop today. Here are some pics to check out. 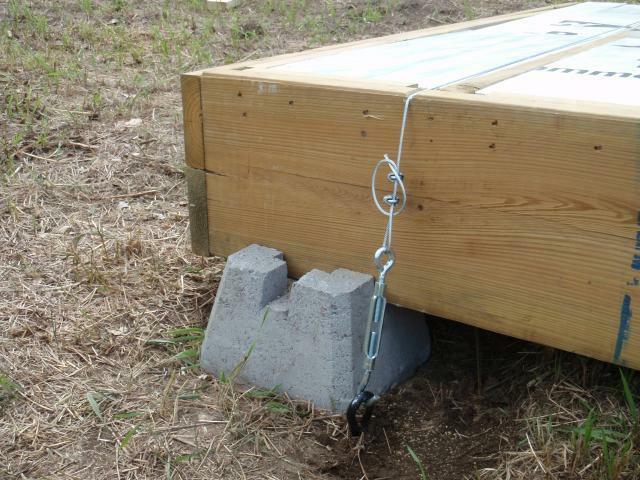 So we put insect screen and hardware cloth under the joists to discourage any ambitous creatures from trying to enter the coop from below. 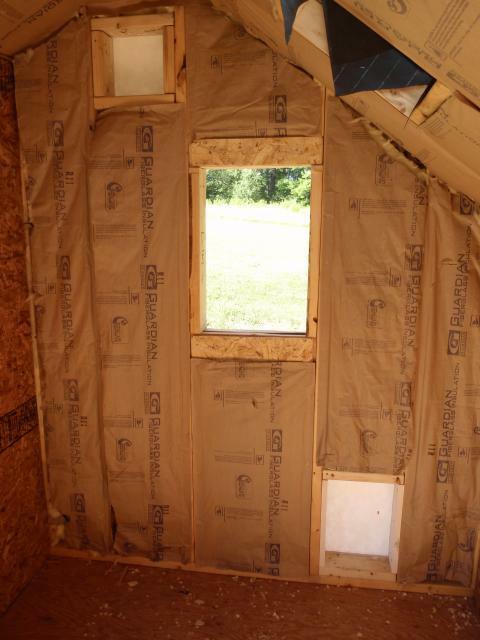 We want to insulate against the really cold New England Winters, so here's the rigid foam insulation in the sub-floor. And we've anchored the whole darn thing into the ground. Why? 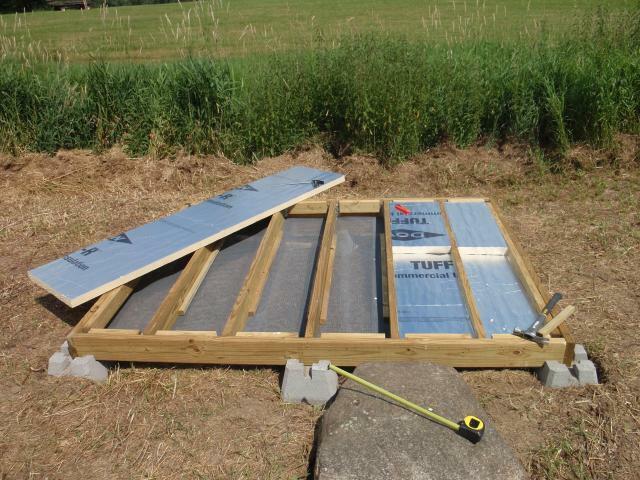 Well, we get a lot of wind, but really, to prevent the coop from migrating down hill since we're building on a slight slope. 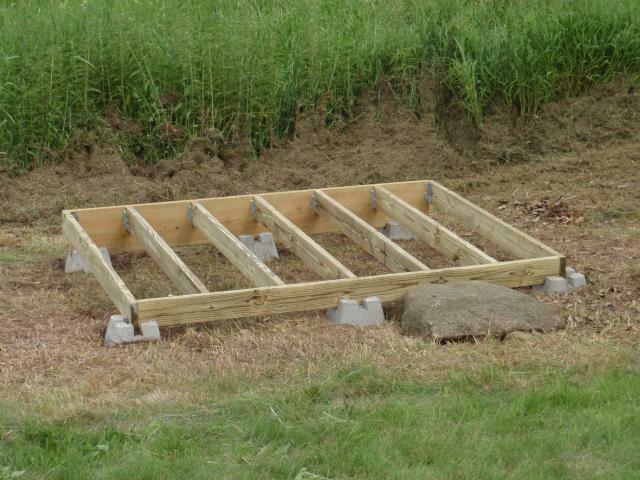 Yes, the footings are level, but these were really inexpensive and worth the little extra effort. 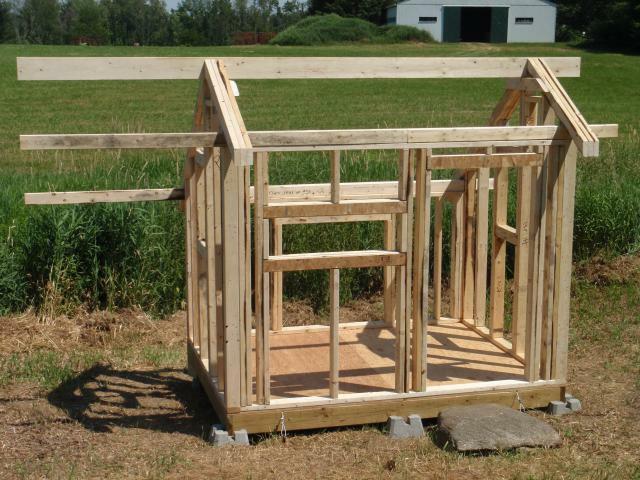 Great progress made on the coop today. Two framed walls up! Here are some more pics. 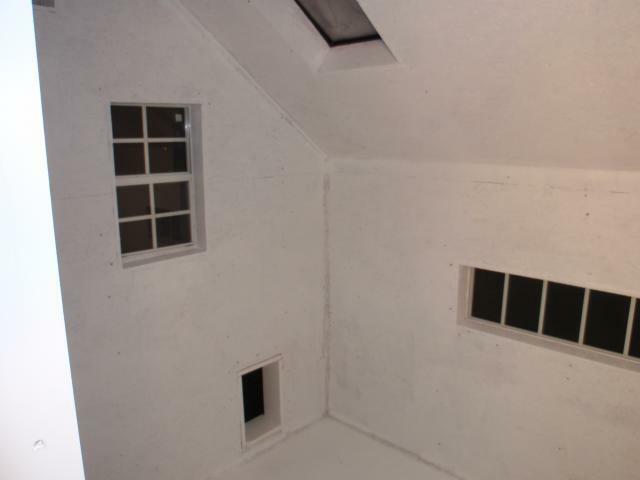 Above is the back wall. Above is one of the side walls. 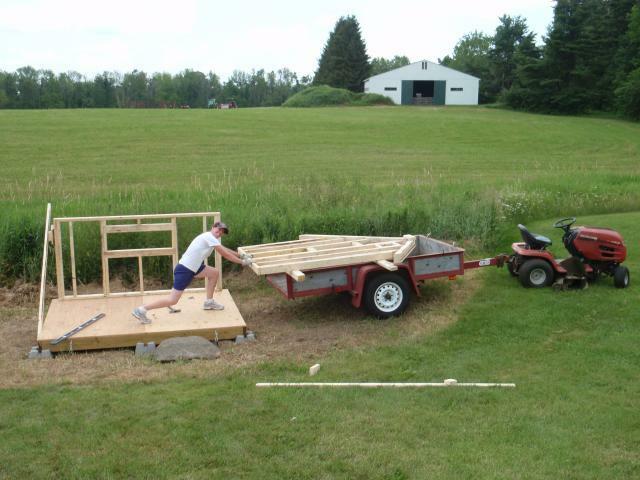 This was a very heavy wall, so we had to use the tractor to bring it from the garage to the coop. With some inginuity, we were able to put it up without a problem. So, this is the fruit of our labor today. Two sides up. We already have the 3rd wall, 2nd side cut. Tomorrow should go even quicker with the front and side. 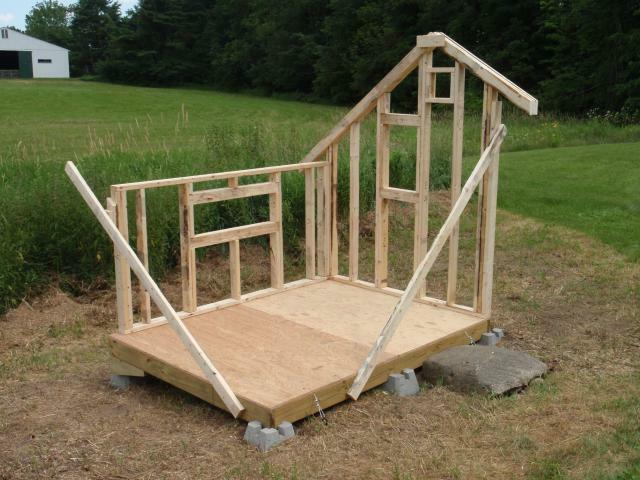 More great progress on the coop today. It was a hot one out there, but we managed. It's getting to be a reality and these chicken's can't wait. It won't be a moment too soon when we get them in there. Work got to a late start today. We had to go to Home Depot to pick up some materials we'll be needing for the coop. I would have liked to have gotten the plywood down on the roof as well today, but I think we are still working at a good clip. Fingers crossed that tomorrow will see the entire roof complete with skylights and all. I couldn't resist taking a few picks just now of the gang. They're SO big now. Another coop pic for sharing. It's taking more time than I thought, but we're still working hard. What an exhausting day working on the coop. 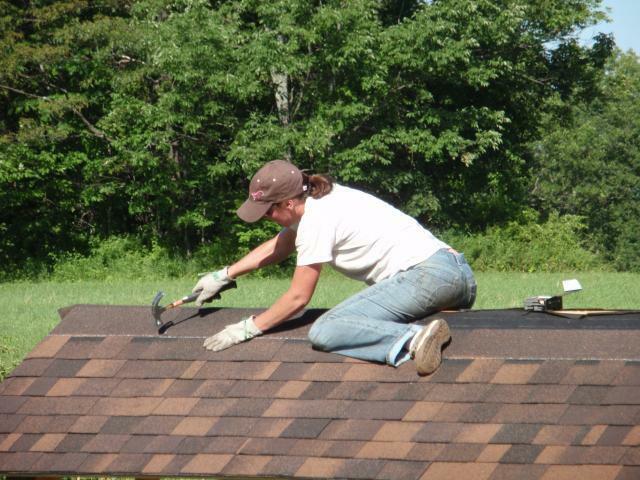 My husband took our two kids to his parents house while I attempted to shingle the roof. I've never roofed anything before. It was a lot of hard, hard and hard work and I didn't quite get the back side done. Okay.....what gives?! I ran out of shingles on my last row...really?! Ah well. I had a super late start today. My husband and I didn't have anyone to watch our little ones, so we had to split the day. He went for a mountain bike ride in the morning and then grocery shopping (forgot his wallet.) He had to come back and then return to the store to actually bring the food home. So, I didn't get started until nearly 2pm. 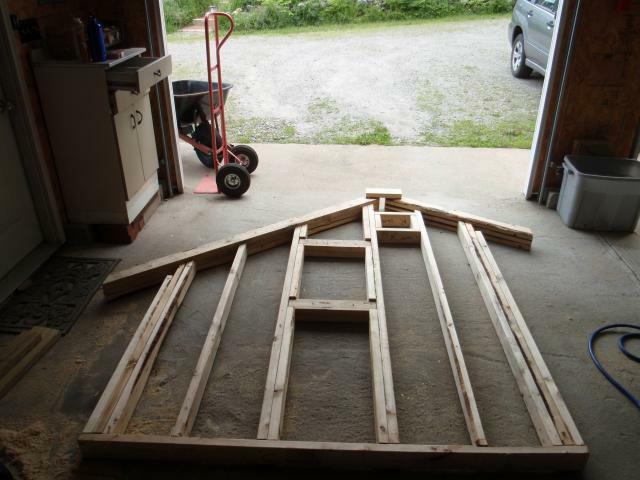 The roof is looking good...for a chicken coop. I just don't think you want to hire me for your house. Enjoy today's pic. And the shot of the end of the day. No work on the coop today. Tried, but it got too dark. 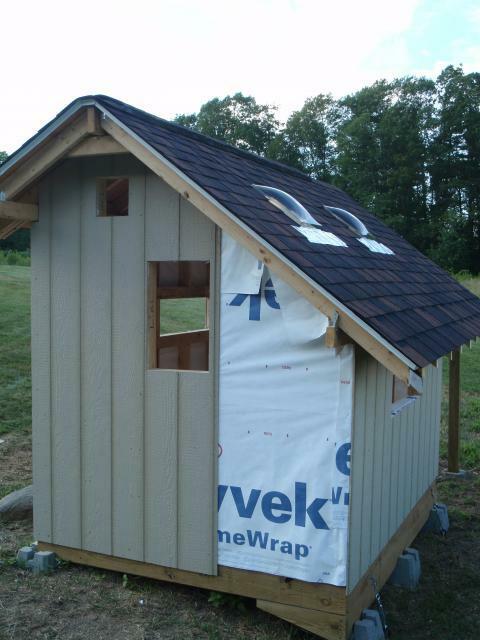 At least we picked up another batch of shingles to finish up the roof. 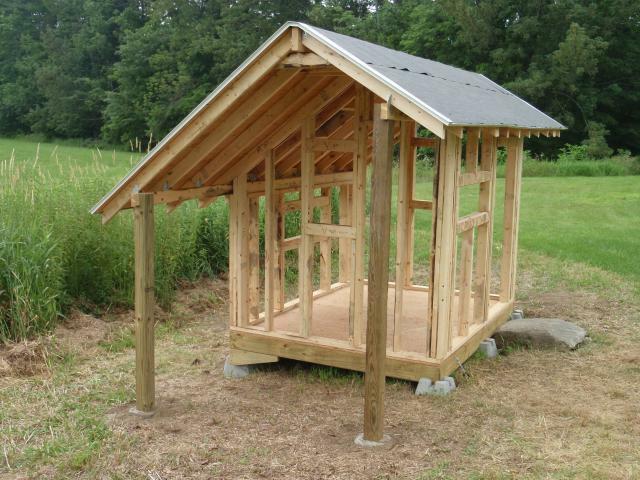 Again, no work on the coop. I'm going through withdrawls and having some anxiety over not getting more done. Yesterday was my husband's birthday, so I couldn't ask him to work on MY coop, that just wouldn't of been very nice of me. However, we will get some work done tomorrow. 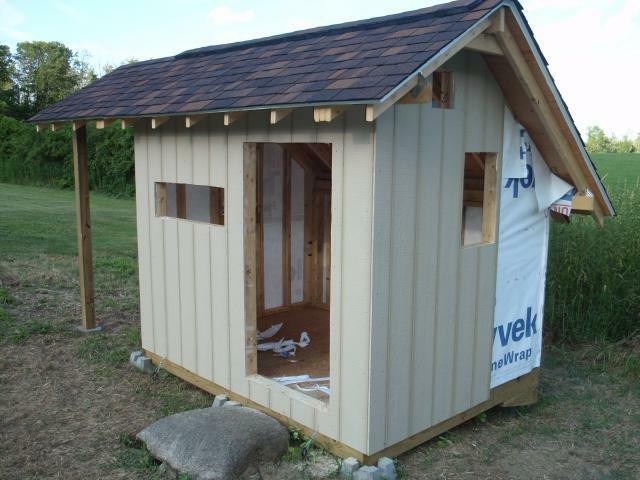 I'll finish the roof and he's going to hopefully finish the siding. That should be a great step in the right direction. I went ahead and scrapped the idea of going solar for the lights etc...I ordered some weather tight lighting. One fixture inside and two for outside. We'll need to run power to the coop. 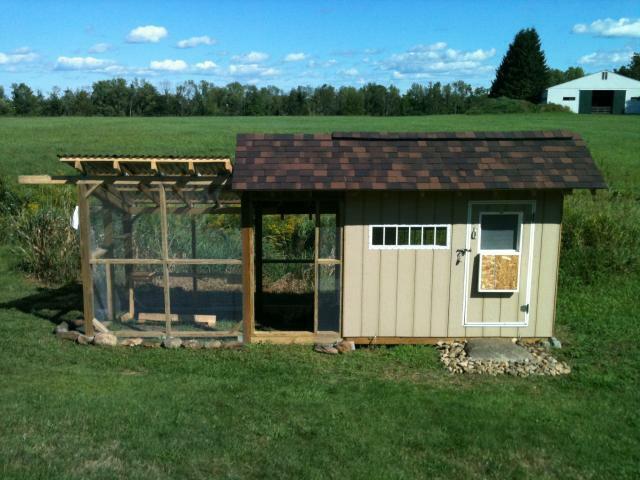 I need to get the birds in soon. They're taking up one whole side of the brooder when they're all on one side. Tonight after I cleaned the brooder out, Pippin, the rooster, was in the middle of the brooder and surrounded by all the girls in a perfect little circle. They were all nestled down in the fresh shavings. Very cute. YEAH!!! 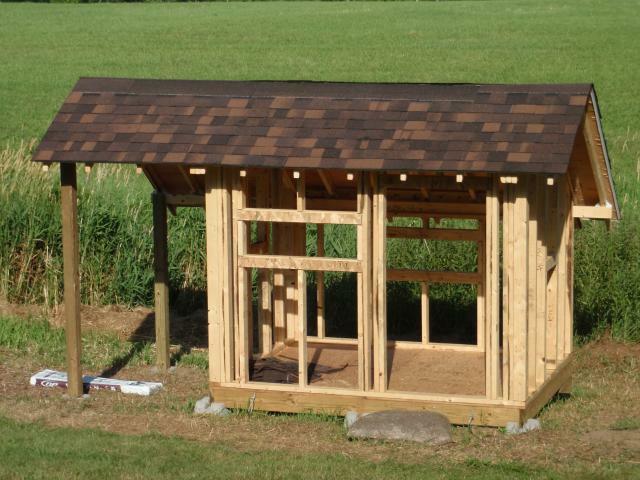 I finished the roof on the coop this morning. It wasn't easy, that's for sure. The extra bag of shingles that my husband got for me was the wrong type. 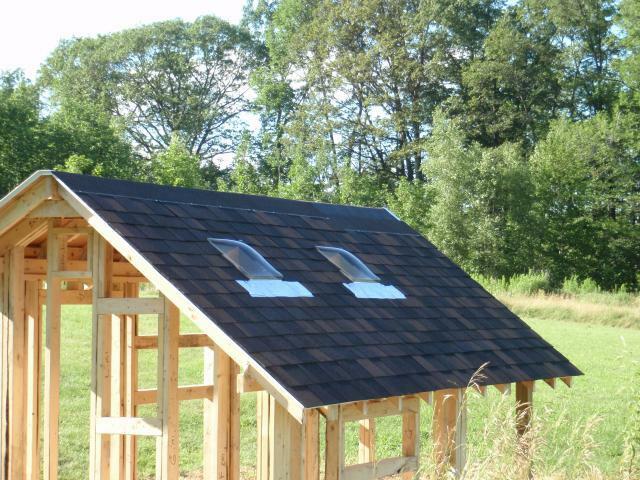 Although he paid for the architectural shingles, they gave him three tab. So I had to go back to the building supply store first thing this morning. Ever wrestle a bag of shingles? It was very difficult. 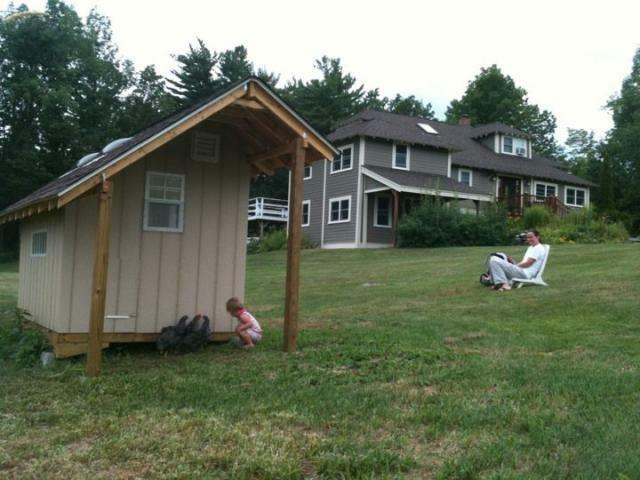 Anyway, I finished the roof and then took over watching my real children while my husband put up some siding. He got the front and back done and one side partially. It's so nice to finally see the coop in this state. We're aiming for the siding to be completed tomorrow and MAYBE even get the insulation and interior finished. 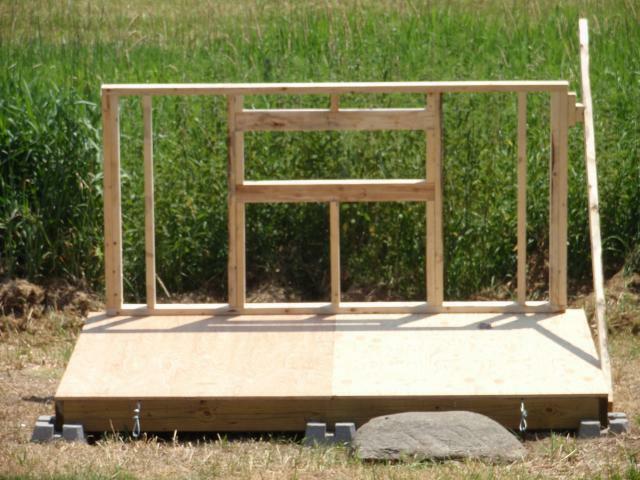 We've decided to use conduit for the wiring, so once the inside is sided, I can go ahead and paint. Here's some pics from todays labor. The never ending coop project continues. 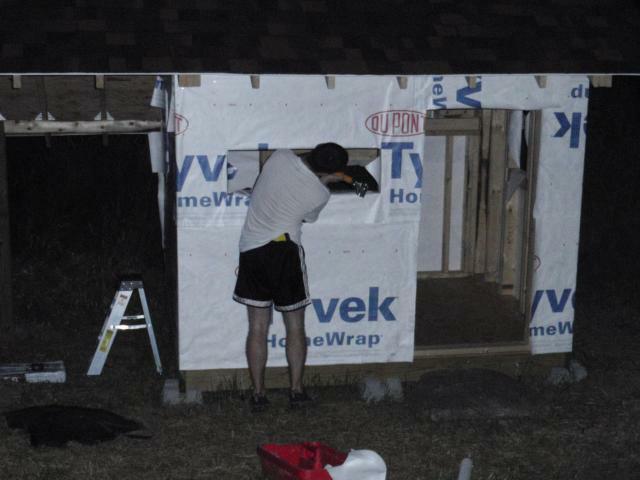 We finished the siding and insulated the walls. Now we need to finish insulating the roof. 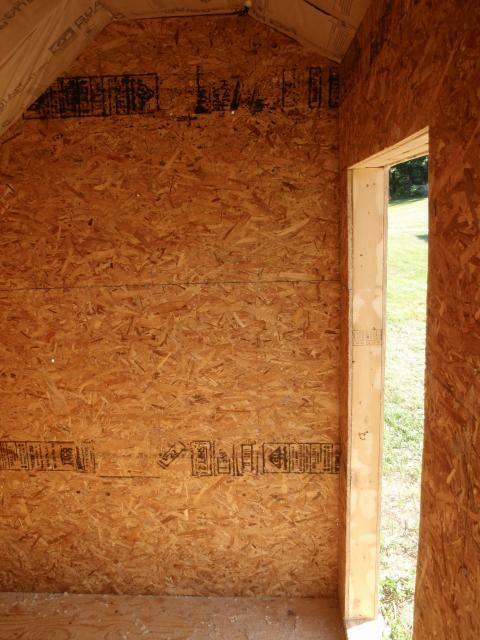 Then the interior walls go up, THANK GOD! So close to done...and yet so far away. We still have a run to build. I was checking on the chicks again this evening. One of the girls has some bald spots under her ears...This has me worried. I think the brooder is too small again and it's causing some stress. I'll keep a close eye. 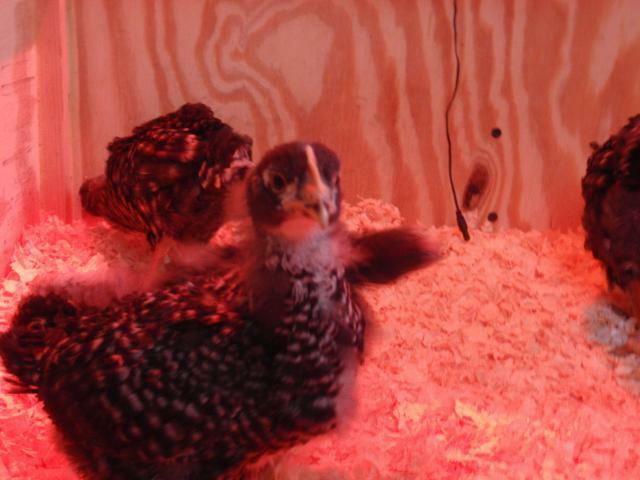 We may need to do another emergency brooder expansion. Here are some pics from today. 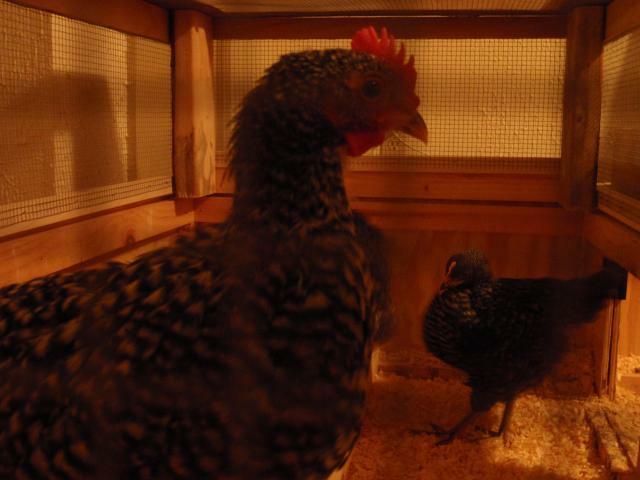 So, another emergency brooder explansion wonderfully executed by my wonderful husband. The chickens are getting so tall that we had to do something about it. MORE HEAD ROOM PLEASE! And we also added a proper perch. Another thing to report today...When I came home from work with my 2 year old and 6 month old daughters in tow, we heard the rooster aka cockrel crowing for the first time. My 2 year old was SO excited and she started to laugh. I laughed too! How strange it is to have a crowing rooster in your HOUSE! No progress on the coop today though. 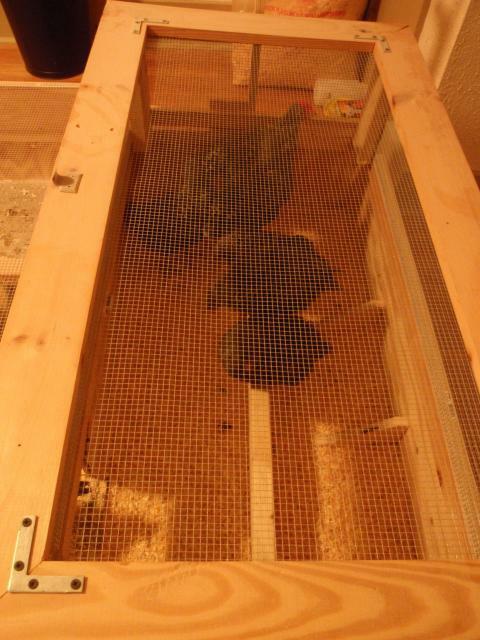 Here are some pics of the brooder expansion and the chickens. They're 7 weeks today. 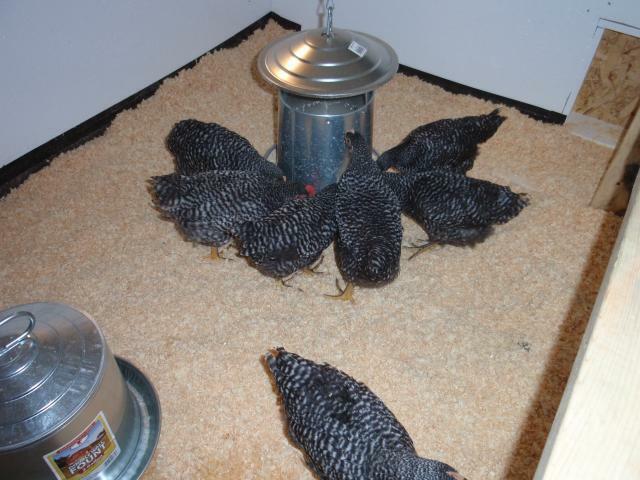 The brooder expansion has been a great success. When I went to leave for work this morning, it was so funny to see them all lined up, perching, and looking out the top of the new lid. 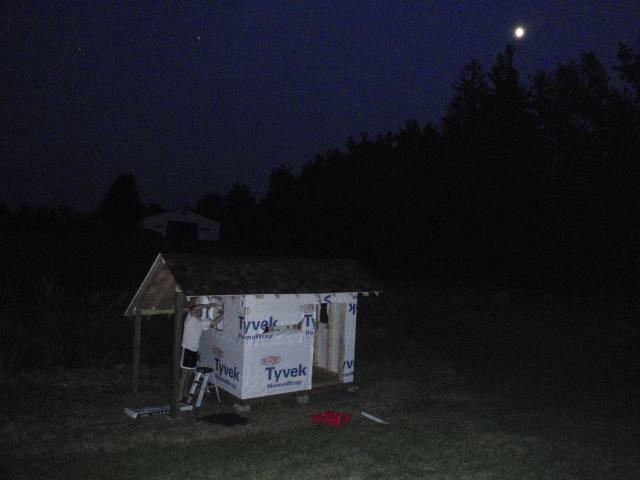 Tonight my husband is out in the coop finishing off the insulation. The roof needed to be done. He also was sealing all the leaks where the vents are for the roof. I love PROGRESS! 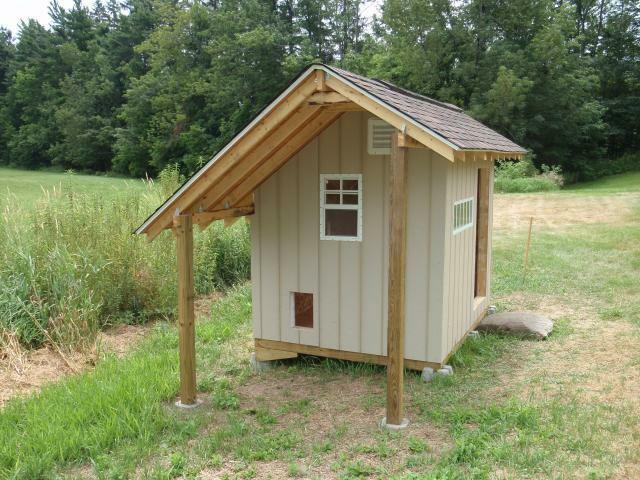 I spent some time today looking at all the different coops that folks on the forum have posted. Some are so incredible, some, not so much. Hopefully, ours will be in the very respectable catagory. Not that it's a competition, but it's always good to see what's out there and how people are doing things. Wednesday, July 20th- Friday, July 22nd. Saturday, July 23rd and Sunday, July 24th. Things are really starting to come together now. Yesterday was my 6th wedding anniversary and how did we celebrate?! Yup, more coop work. And more coop work today. Although we did get a baby sitter and were able to go see the new Harry Potter movie. By far they saved the best for last. So, this evening I went to check on chickens...and I found them all huddled on top of the bricks and one of the girls was sitting in the waterer...sigh. Silly chickens. I gave them some fresh water and I hope they find a different spot to sleep tonight. More pics, enjoy! 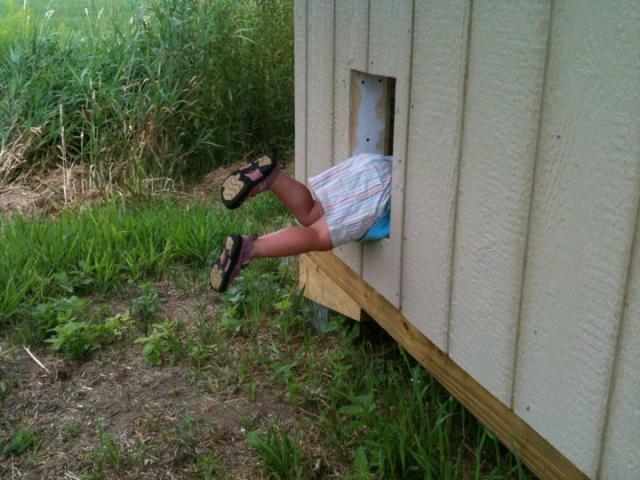 The chicken coop inspector takes her work very serviously...she really gets into it...HEHEHE. Monday, July 25th and Tuesday, July 26th. These past two days I've spent resting my back. I hurt it doing almost nothing. 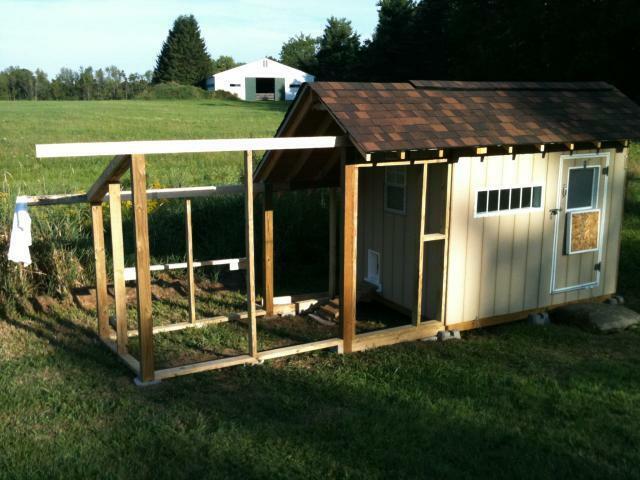 But once again my husband has stepped up to the plate and worked on the coop for me tonight. He finished all the interior woodwork! I can now paint the inside! 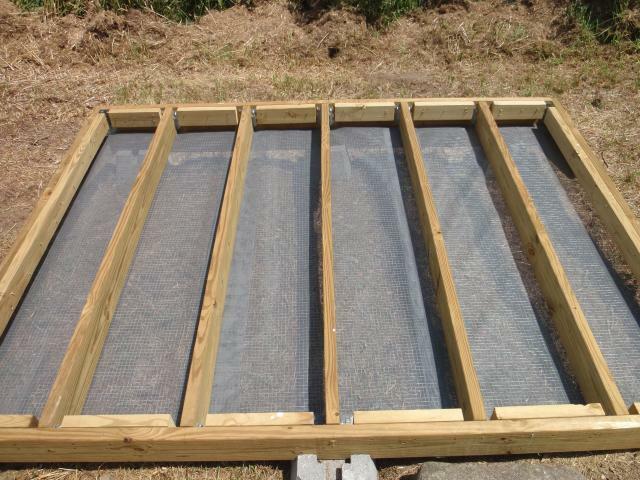 And all that needs to be completed now; the coop door, install the chicken door and build the run. Cake, right!? It's so nice to see the light at the end of the tunnel. 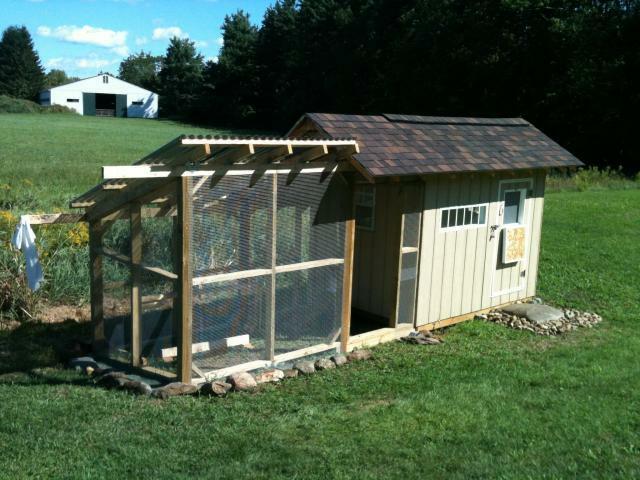 I think the chickens will really like their new home and I can't wait to get them in as soon as possible. The coop work continues! Tonight, I got to prime the inside. The chip board is like a sponge for paint. It took the whole gallon of primer. I'm hoping that the gallon of enamel goes on smooth now. Enjoy the pics! Friday, Saturday AND Sunday July 31st. BIG, BIG, BIG weekend. 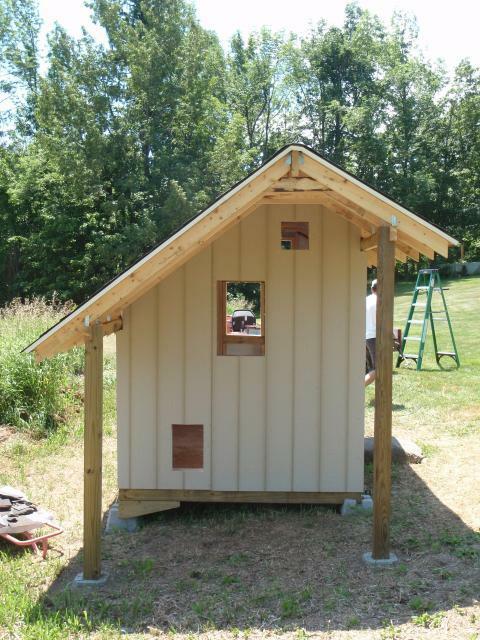 With a lot of hard work, some swearing and a little grit (no pun intended) we were able to get the coop done enough to move the birds in. 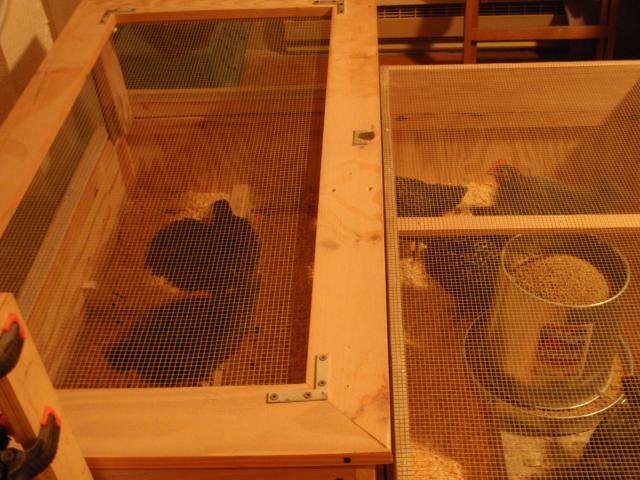 There's still a lot to do, but at least they can enjoy the MUCH roomier inside of the coop and not the now cramped brooder. Here are some pics. Now that the chickens are in their coop, the pace has slowed down to a more tolerable roar. 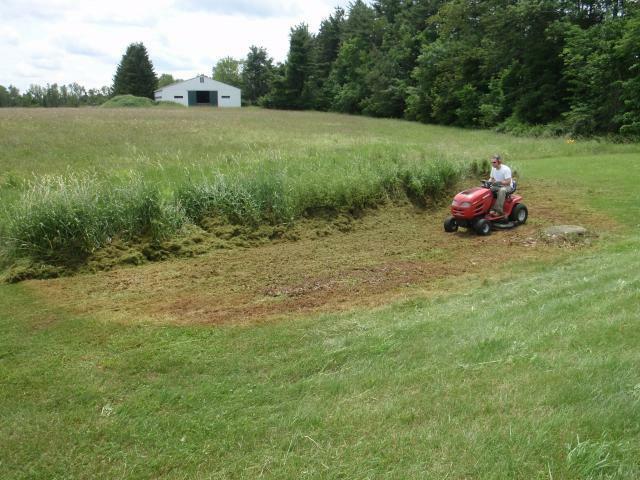 We can start to take our time and work on details and minor tasks. Today was a nice day, the flock was outside for the very first time without any gate. I just opened the main door and let them explore. It went very, very well. 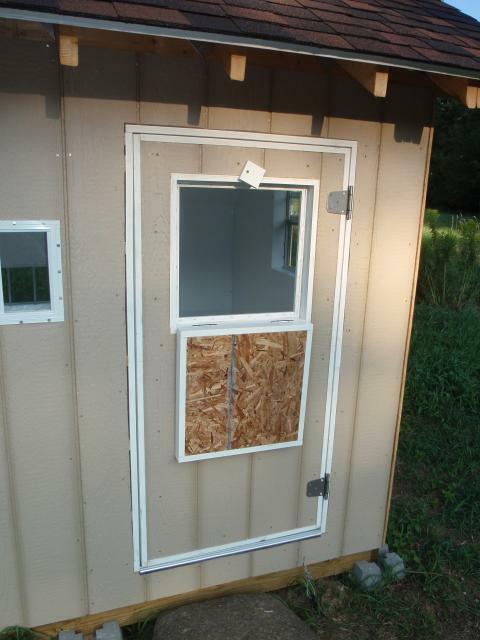 Although I almost crushed one of the chickens with the door when a gust of wind took it and slammed it shut. Good going me! We'll be putting a proper hook on the door to fix that. More pics! 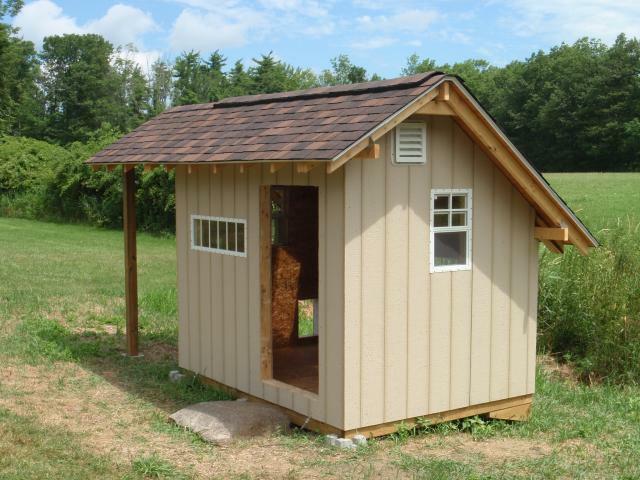 Some one on the forum had asked how far the coop was from the house. This should give you a good idea. Not too far. We had a nice weekend despite the threat of rain and the very high humidity. We're now taking our time with the detail work. My husband loves to say that, "the Devil is in the details." 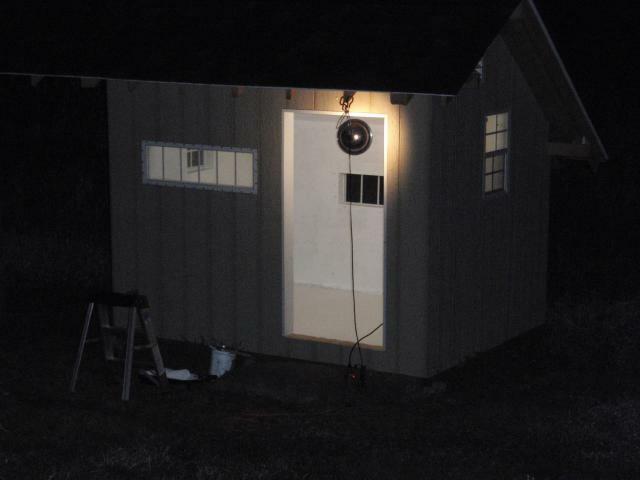 Saturday night I primed the roosts that DH built. I intended to paint them tonight, but it didn't happen. We did get the automatic door hung (it WORKS!!!) 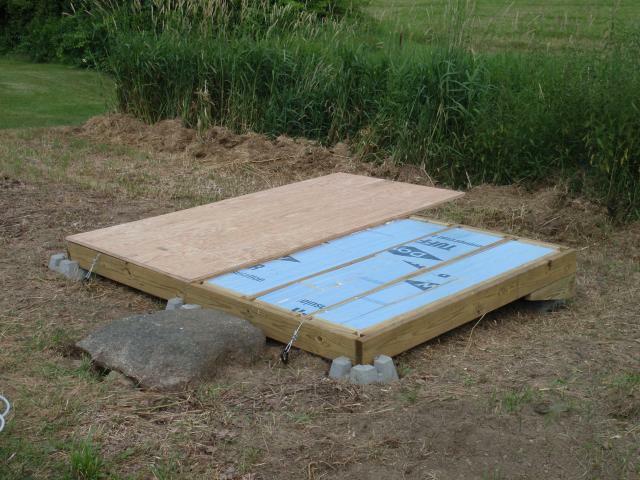 And DH built the ramp. 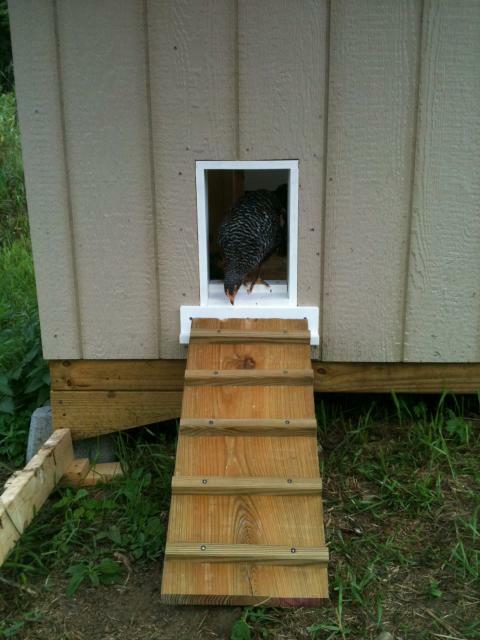 The chickens were confused for a while when I closed the main door to the coop. They all congregated around on the rock...looking at the door and not sure why it was closed. I had to physically show them the chicken door several times before it sunk in. 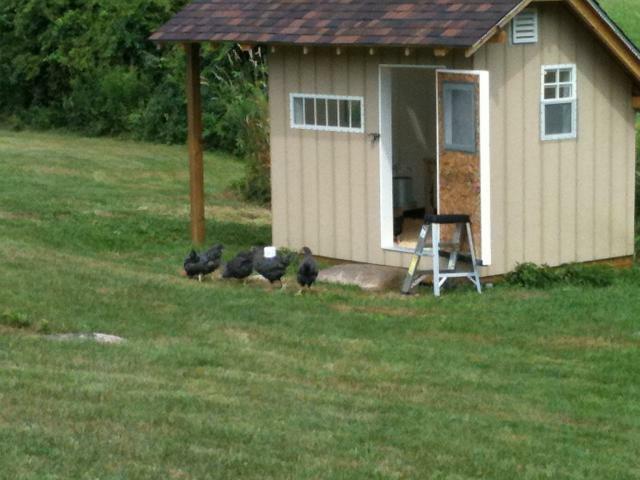 I was nervous they weren't going to get inside the coop before the door shut, but they did with plenty of time. 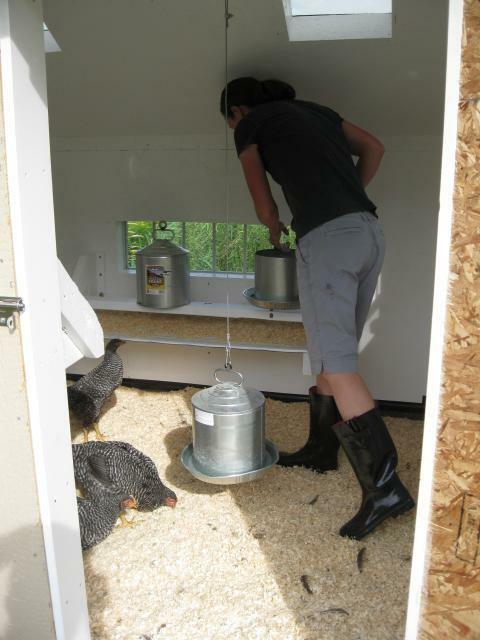 The other thing we did was take one of those solar yard stakes and made a little mount for it inside the coop. That way they have a litte bit of light to see when they jump on and off the perch. I didn't think they needed a light, but I read in my "Chicken for Dummies" that it's a good idea to have one. I also took a fun video today. And here are some pictures from today. What a nice day it was today. We had a babysitter come and watch the girls while my husband and I worked on the coop/run. I think we made a lot of progress on the run. At the end of the afternoon, we were sitting on the lawn and watching all these birds and dragonflies darting around the sky and snatching up these bugs. They were really swarming. I realised what they were eating when I turned to my side and saw an enormous ant colony sending off it's females to start new colonies! I immediately went and got the chickens! They started eating up all the ants. It was like candy! My husband was so excited. He was astonished when I told him that all the ants were gone in only a few minutes. Here are some pics from the day. 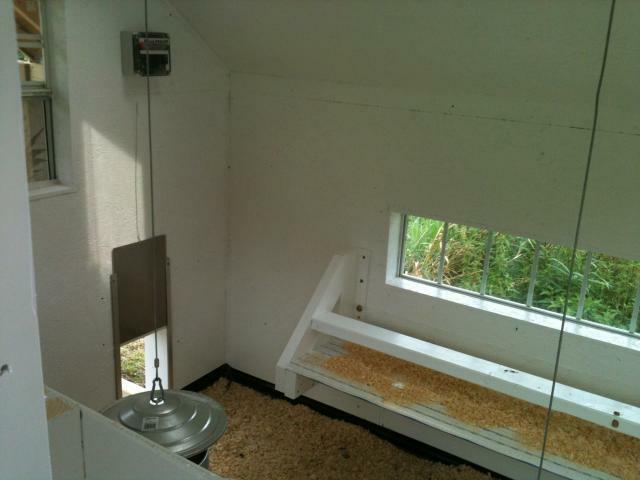 I'm also including pics taken today of the inside of the coop even though we finished the perches this week and hung the automatic door. Above is the top roost. 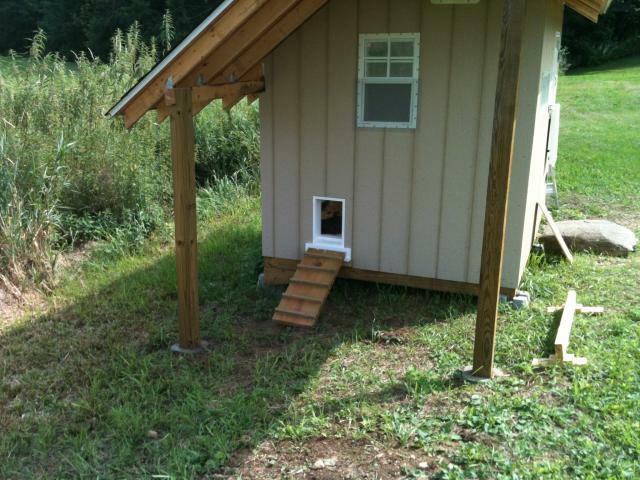 Above is the bottom roost and the automatic chicken door. And the run so far. 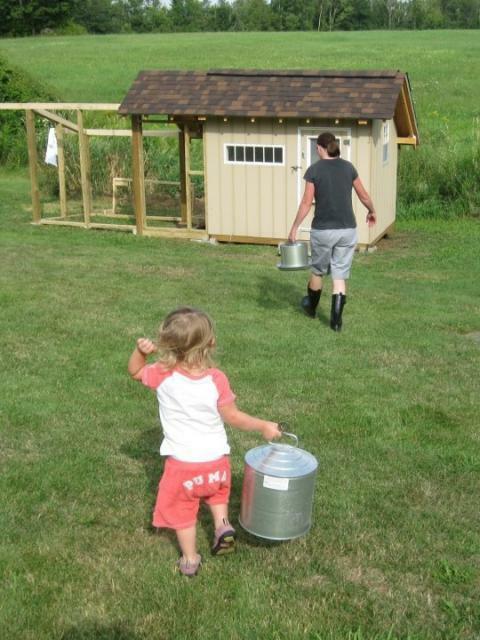 These pictures were taken by my mother-in-law of me and my 2 year old daughter taking care of the chickens. Thanks Mom! Every day seems to bring a new funny story with the chickens. They've been free-ranging for a while now and doing just fine. Just this morning I was standing in the kitchen when I heard the rooster, Pippin, crow. I said to my husband, "He sounded like he was just outside the window." I walked over and there he was, on the steps to the door, crowing his little heart out. All the girls were lined up below him on the lower steps. Too funny. And every day when we get home from work, they come running from where ever they are in the yard and look to Ryleigh, my 2 year old, for their mealworm treats. We did some work on the run this weekend. Here are the latest pics. More of a diary of a coop build. I love how you put the sun lights in the roof. Love how you kept us updated for each day! 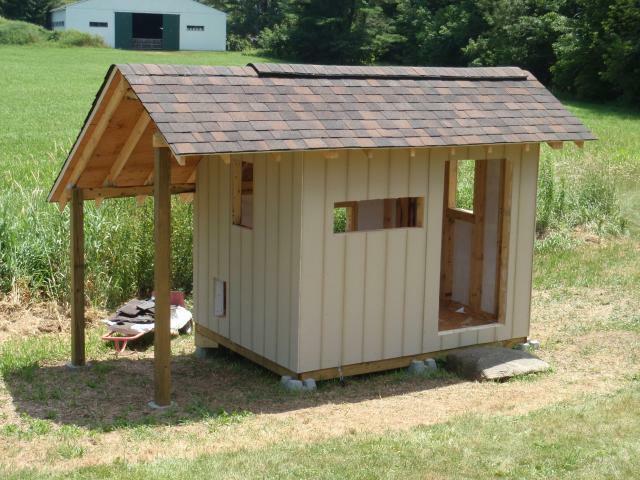 The coop came out great! Only thing I would change, is add a bigger run if they dont free range during the day. 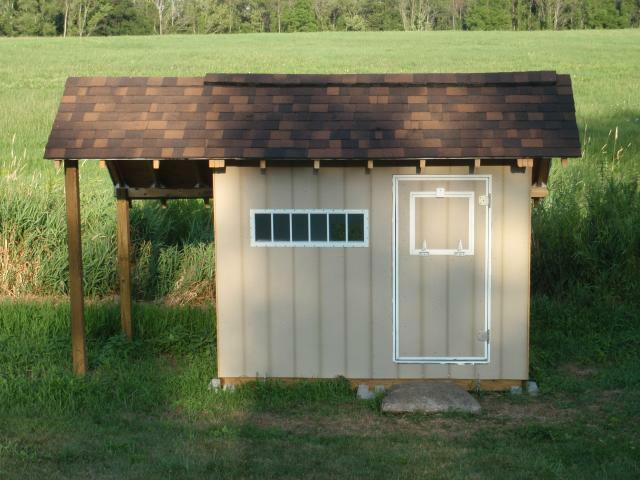 LOVE this coop and your diary of the project! Great job! Now come build mine! Wow! It was a lot of work, but looks fantastic!